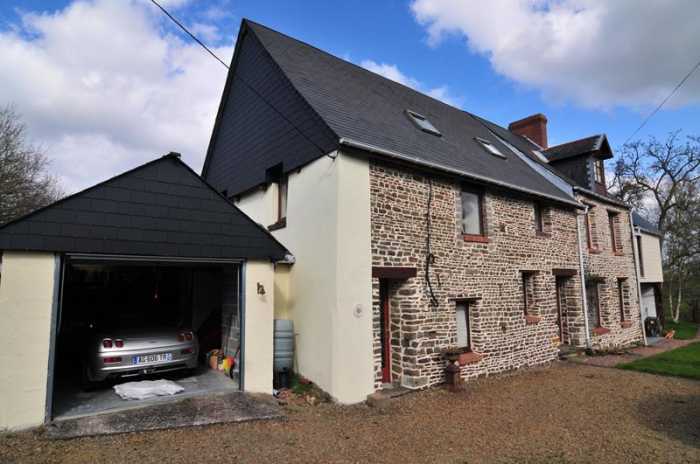 Properties for sale in Normandy, France - AHIN-SIF-00997 Nr Vassy 14410 Detached 5 bedroomed stone Farmhouse with 2.5 acres for sale in a quiet rural hamlet in Normandy. The property has been renovated over the last 26 years and provides spacious, light and versatile family accommodation. It stands in a quiet position, facing south, with outbuildings, garden and paddock. Viewing is highly recommended to fully appreciate the house. It is in a convenient position near Vassy in the Calvados department (Normandy region) in the north of France 70 km from the port at Caen Ouistreham, the department capital. Vassy is 221 km from Paris (mainline train station at Vire (15 minutes away) and 295 km from the port at Calais. Rennes – Saint-Jacques Airport (RNS) is approximately two hours and 10 minute’s drive from Vassy. Flights arrive here from Southampton year round as well as seasonally from Cork, Dublin, Edinburgh, Exeter and Manchester. Many activities are available for those staying in Vassy with lots of glorious countryside to be explored making this ideal for hiking, horse riding and cycling. There are public tennis courts nearby in the area and two swimming pools as well as several golf courses including one a Clécy, which is 20 kilometers from Vassy and the 18 hole Golf de Vire. Entrance Hall Window and glazed door to south elevation. Electrics. Tiled floor. Stairs to first floor with storage area under. Dining Room 6.49 x 3.88m Window and glazed double doors to front and window to rear elevations. Tiled floor. Kitchen/Breakfast Room 4.07 x 3.04m Range of matching base and wall units including display unit. Sinks with mixer tap. Space for under counter fridge and freezer. Space for free standing cooker with hood over. Space and plumbing for washing machine. Worktops and tiled splash-backs. Breakfast bar. Space and plumbing for dishwasher. Window and partly glazed door to rear elevation. Lounge 6.49 x 4.92m Window to rear and 2 windows to front elevation. Tiled floor. Electrics. Painted beams. Open fireplace. 2 window seats. Door to second staircase. Built-in cupboard. Landing Door to stairs to second floor. Wood flooring. Window to rear elevation. Bedroom 1 4.66 x 3.74m 2 windows to front with window seats. Wood flooring. Ornamental fireplace. Built-in cupboard. Shower Room 2.97 x 2.72m Window to rear elevation. Tiled floor. Convector heater. WC. Vanity unit. Shower. Games Room 8.03 x 4.41m 2 Velux windows to front and rear elevations. Exposed “A” frame and beams. Laminate flooring. Sloping ceiling. Landing Window to front elevation. Wood flooring. Wired in smoke detector. Exposed beams. Bedroom 3 3.89 x 3.08m Window to front elevation. Wood flooring. Exposed beam. Built-in wardrobes to one wall. Bedroom 4 3.85 x 3.15m Window to west and rear elevations. Wood flooring. Built-in wardrobe. Exposed beam. Bedroom 5 3.39 x 2.56m Window to west elevation. Wood flooring. Exposed beam. Cloakroom Window to rear elevation. Hand basin. WC. Tiled floor. Shower Room 2.75 x 2.74m Window to rear elevation.. Vanity unit. Shower with electric shower. WC. Bidet. Hot water cylinder. Tiled floor and walls. Electric panel radiator. Long gravel drive. The front garden is laid to lawn with raised stone flower beds. Open fronted seating area/garden room 3.85 x 3.02m. Detached Garage 4.55 x 4.37m Constructed of block. Metal up and over door. Power and light. Pedestrian door to rear elevation. Lean-to Log Store. Attached Barn to the east gable 6.49 x 3.95m Double doors. Stairs to loft storage area over. The rear garden is laid to lawn and ornamental pond. Detached Stone Bakery under corrugated iron roof, used as wood store. Separate terrace seating areas. Soft fruit cages. Mains water, electricity and telephone are connected. Broadband internet connection. All water septic tank installed in 1998. Please note : There is no Energy Report for this property because there is an open fire but no central heating.